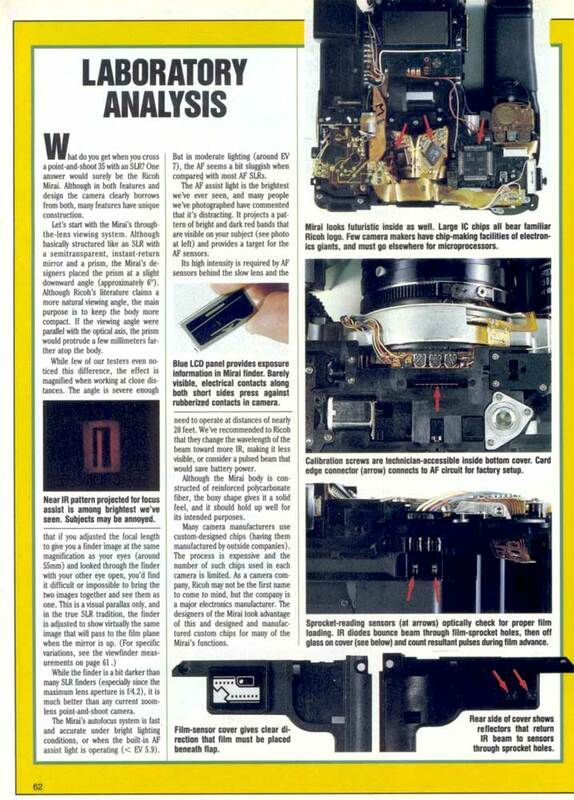 Discussion in 'Modern Film Cameras' started by jdm_von_weinberg, May 16, 2011. 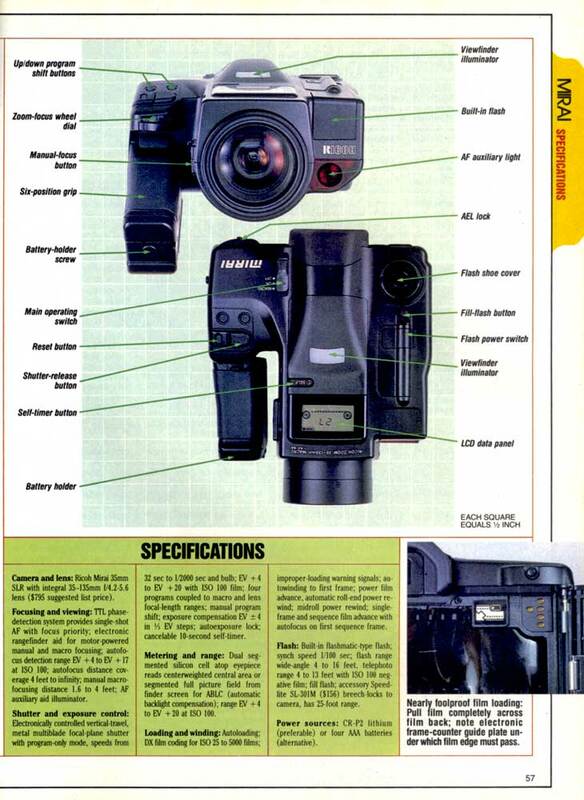 This as a 1988 camera (although I thought it interesting that the copyright date on the Mirai manual is 1985). I'll be up-front about this post. It's too long, except that the information I could find on the Mirai was so fragmentary and scattered that I felt it would be good to have its story told in one well-Googled™ site (aka, Photo.net, the secret of my Google™ success). I have tried to provide links to the sources, but it would be difficult to establish any priority on much of the information since what is already there is fairly clearly widely "borrowed" already. I do take responsibility for the corrections I have made from direct examination of information from Ricoh and the camera itself. Please do not hesitate to skip over the boring parts (to you). Somewhere out there, there is a community of would-be Ricoh collectors yearning for more information about these things. Although it was never my intent to become a Ricoh collector, I seem to be one by default. I have no intention of going farther down this path, but then I didn't earlier either. I was given a High Color 35, then thought the 500 was nice as a sort of "Contaxish" RF, then it seemed natural to see what had happened to the 500 in the 500G. For the life of me, I can't remember what made me look at the Mirai SLR version. All I do remember is that people kept outbidding me on them, and so I went a little, well, funny about them. What follows may be of some interest to those who sometimes ask here "what's it like to buy on eBay?" This is one experience out of over 500 eBay purchases, and illustrates why I am willing to risk buying on what is truly a world wide flea market. It turned into more of an adventure than I had anticipated, with some deviations along the line that were unanticipated. Before I got the camera I am reporting on here, I had won another auction for a "Mirai SLR" camera on eBay--however, when it came it turned out to be a Mirai Zoom 3 AF viewfinder camera of similar appearance. I immediately emailed the vendor and said that it was not as described. The vendor responded with what were apparently her only words "Camera as described, no returns". I tried again, with the same response so I contacted the eBay resolutions people (in over 500 purchases, the first time for me). The vendor responded to their inquiry with the 'offer' : "Camera as described, no returns". I was beginning to see a pattern, so told Resolutions my story again and that the "offer" was not acceptable, and they eventually ruled in my favor. It turned out that they sent me a pre-paid shipping label to the vendor (with confirmation), so I boxed it up in its original packing and sent it off. As soon as the confirmation came through, my money was refunded directly by eBay, and they took care of getting the refund money from the vendor. There was a lesson here: do not bid last minute on something on the basis of a description of an item from someone who, as it turned out, had probably never offered a camera for sale before. In looking at the pattern of past sales on all versions of Mirai cameras, I think that the my vendor and me are not the only people to have been confused by the Mirai clan. Prices that are suitable for the first version are often paid for the later versions, and vice versa. Next day, I did find a BIN offer from Canada, so snapped it up immediately -- for about one-third of the prices I had been willing to pay. Bless those snipers, after all. It came Saturday after only a few days. Apparently the world's longest undefended border is no longer "defended" by Canadian and American customs. Previous expedited packages from Canada going both ways (sending stuff to my daughter in Vancouver) took much, much longer. Hope it lasts and I'll be happier about buying from Canadian vendors (even though the postage is still quite high - nearly as much as from Britain). Ricoh Mirai 35-135 Zoom, short for "Ricoh Mirai Zoom 35-135mm Macro f/4.2-5.6," I guess. In any case, there are two tiers of prices - one around $30 and the other above $100. However, all models seem to show this same range. Ricoh Company, Ltd. (??????? Kabushiki-gaisha Rik?) still makes a number of digital point and shoot cameras, but its primary business is in copy machines. In camera catalogs like McKoewn's and Kadlubek it is usually listed as "Riken Optical, Ltd."
Ricoh Mirai - 1988 AF Bridge SLR - This post. There's not a lot of information on this camera, at least that I could find in fairly intensive searching (e.g., Camerapedia has only http://camera-wiki.org/wiki/Ricoh_Mirai ). One Ricoh page on some of their 35mm cameras is available at http://www.gmc-ag.ch/ricoh/35mm/ , which seems difficult to get to from any directly available home page. My older copy of McKeown's Cameras has only a very few of the many cameras made by this company, and nothing at all on the Mirai. This camera's name is Mirai (??) which, it seems, is Japanese for "future." This first Mirai was a "bridge" SLR, maybe one of the first, even. The earliest reference I can find to the idea of 'bridge cameras' seems to be in 1988 ( http://en.wikipedia.org/wiki/Bridge_camera , http://pqasb.pqarchiver.com/chicagotribune/access/24768530.html?dids=24768530:24768530&FMT=ABS&FMTS=ABS:FT&date=Apr+29%2C+1988&author=Sandy+Colton%2C+Associated+Press+Newsfeatures&pub=Chicago+Tribune+%28pre-1997+Fulltext%29&desc=NEW+BRIDGE+CAMERAS+OFFER+PERKS+TO+NOVICE+AND+PRO+ALIKE&pqatl=google ). 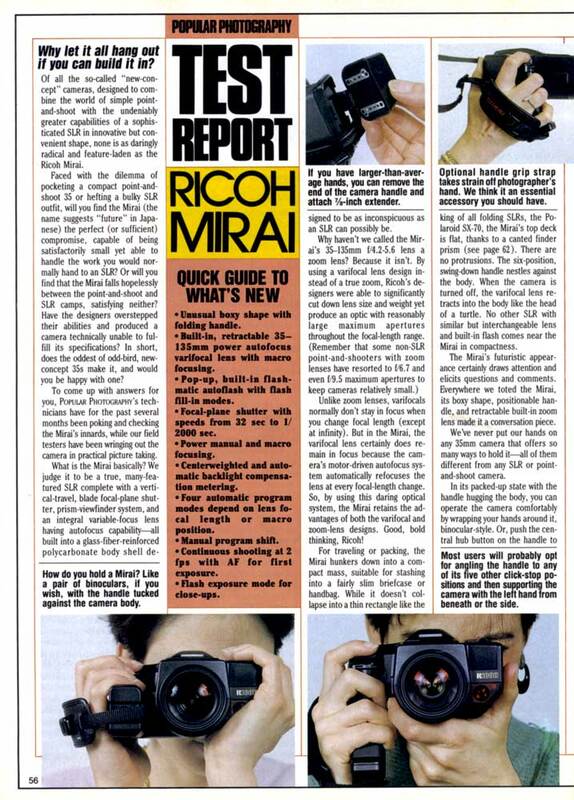 The Ricoh camera mentioned in the abstract of this source, however, was a Ricoh FF-7 (a P&S viewfinder camera), not the Mirai. The Olympus AZ-4 is a near twin of the Ricoh Mirai, having been co-developed and marketed separately. According to Wikipedia (no references given), this version appeared in the 1989 Batman film. The service manual (available at http://www.nodevice.com/user_manual/olympus/35_mm_point-and-shoot/az-4_zoom.html ) for it is essentially identical to the Ricoh manual except for the omission of a number of minor features (and many tables and so on available in the Ricoh manual), but not on the Olympus. Ricoh only features are such as an electric remote cord, different batteries, and a few other minor differences. The outward appearance is also slightly different, with a decided SLR bump on the Mirai, where that has been combined into the top cover of the AZ-4 (see the illustrations of the same page from the two manuals). 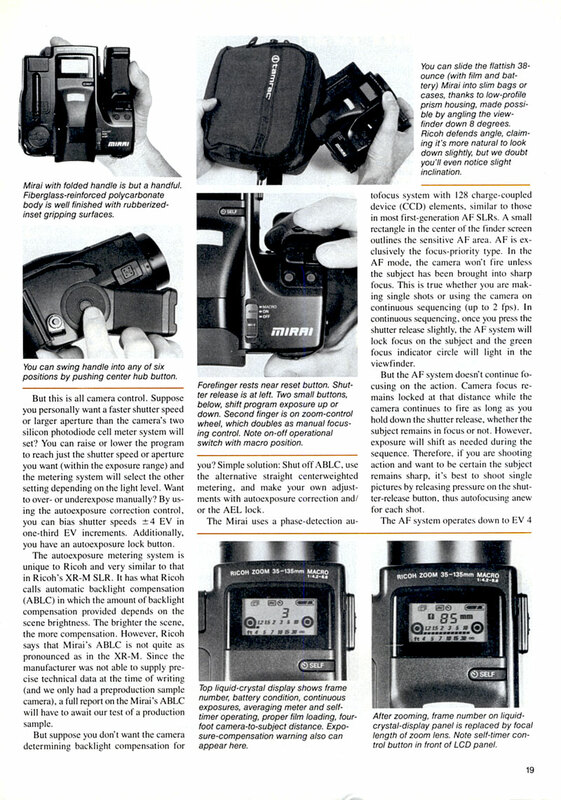 (compare the two cameras in the page below from the respective manuals). 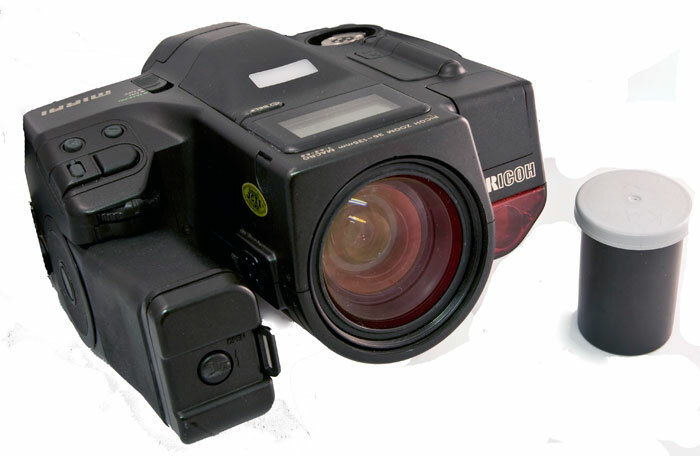 In 1989, according to Kadlubek, a new model, the Mirai 105 was introduced ( http://classiccameras-photography.blogspot.com/2011/04/ricoh-mirai-105.html ). Kadlubek lists it as "SLR-Bridge" but it is in fact a zooming viewfinder camera. Kadlubek also lists the 1991 viewfinder Mirai Zoom 3 ( http://classiccameras-photography.blogspot.com/2011/04/ricoh-mirai-zoom-3.html ) viewfinder version as a "SLR-bridge". Both of these cameras are essentially the Mirai converted into a zoom viewfinder camera. Both have a viewfinder window on the front, next to the lens, and different lens caps for each them nicely cover the viewfinder window as well as the front of the lens -- little chance of forgetting to take of the lens cap with these. I do not have and have not seen an original Mirai lens cap, but any 52mm cap will work fine. For a "simple" camera, as this is supposed to be, there are divers different buttons and switches. 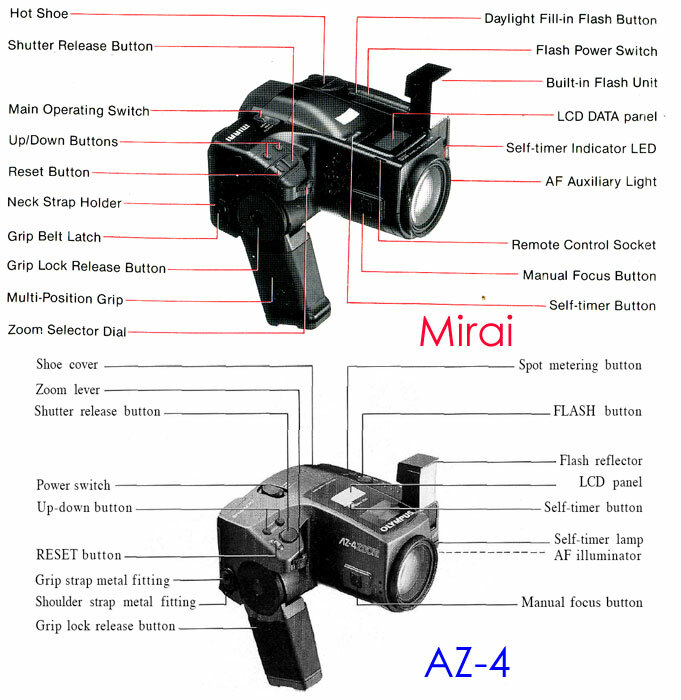 The comparison manual pages for the Mirai and the AZ-4 indicate some of these. The TOP has an "on-off-macro" switch, a button for the self timer, a release for the auxiliary flash, a specialized hot shoe- normally under a screw cover which has been lost on mine, a pair of right and left arrow buttons, the shutter release button, and a reset button. The top also has a LCD panel presenting various settings, exposure, and the like. The wheel to choose focal length is on the front near the shutter release. On the side of the lens case, there is a large "manual focus" button that is used in conjunction with the focal length wheel to electrically bring the camera into focus. There is also a button to release the battery holder/handle and set its angle for comfortable holding. The BOTTOM is simple - only a switch for A and M focus mode and a switch that turns off a beep when focus is achieved. Finally, there is a button and slide to open the film back (a data back was available) and a door ("Creative Control Panel Cover") with more buttons underneath it. 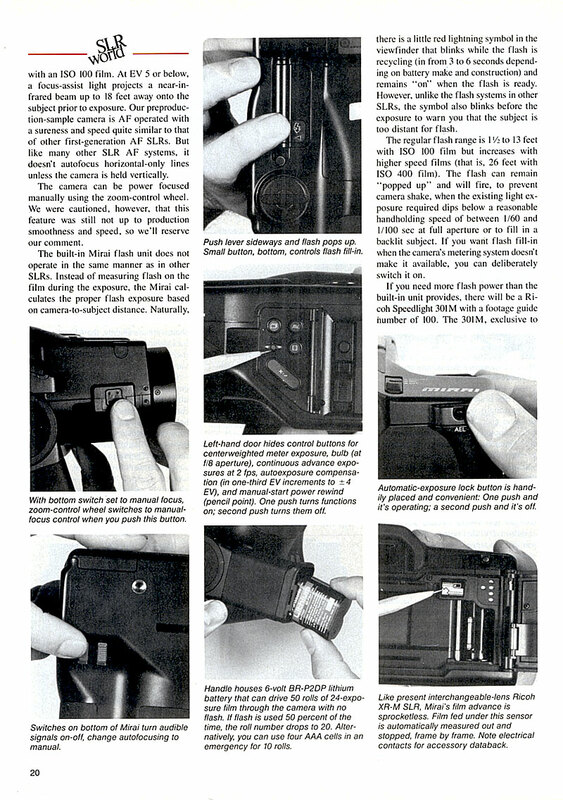 There is a button for continuous or single frame shooting, a manual rewind button (most film rewinds automatically), a button for bulb exposure, an exposure compensation +/- button, and an "average" button for setting an "automatic backlight control" (default) or a center-weighted exposure method. The latter meter reading is recommended for slide film. This is the least busy part of the camera. There is a window through which the film canister label shows, and at the upper right, an AEL button for exposure lock. Various displays will blink to give additional information such as AF not having been achieved. 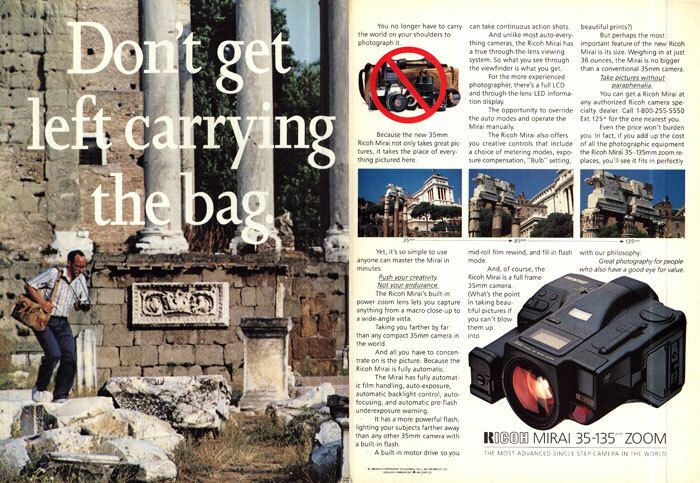 Some fairly "professional" level film cameras from the AF era have similar profusion of controls, and the number of these on the Mirai may have indicated their intention that this camera would replace a system-style SLR for many (see the ad at the start). The camera has only the one focus point indicated by a rectangle in the middle of the viewfinder. It works well enough, but some patience is required and there need to be vertical and contrasty elements for it to work well. Like contemporary viewfinder AF cameras, there is an infrared focus assist light that works even in dark situations out to about 5.5 meters. In addition to information on aperture and shutter speed, a panel at the bottom of the screen also shows built-in flash status, arrows for manual focusing, macro mode, and exposure lock. AF can also be locked by depressing the shutter release half-way and holding while recomposing, as on many cameras. Since I was mostly interested in this as a "pioneer" AF SLR, I simply used the camera as most purchasers must have -- as a "point-and-shoot AF" mostly. The AF was a little tricky and works best only when there are vertical lines in the focus rectangle, as said. Zooming is slow, but adequate. The zoom knob acts as focus for macro work. Relatively close and far off seem to work well with crisp results if you let the camera have the time it needs. This is the first camera that I have ever left the focus confirmation 'beep' stay on. I used Fuji 200 C/N film. In fact, the strange form and the 'handle' make the camera easy to hold and generally easy to compose images with. And of course with a non-interchangeable lens, a brick wall is a necessity, even if these are small images. The topsy angles of the shots reflects the inability of the camera to focus on the wall properly because it saw no vertical lines to grab onto. I think pretty decent considering, and there is only a little barrel distortion on the wide end. A 'lost' camera? Not altogether, but not much discussed despite its apparent kinship to things like the earlier Canon prototypes done by Colani a few years earlier. Whatever it is, this is not a "Classic Manual Camera". That's it - thanks for your patience. Thanks for the (long) article. It immediately caught my interest since I still have a Mirai lying around. Including data back and handstrap. I used it during a few trips in the early 90s next to a Canon A1 + lenses but soon I changed back to a full FD system for travel, until that was replaced by an EOS setup. The Mirai only found intermittant use during that period. It was my first introduction to autofocus. I had the impression (please correct me if I’m wrong) that Ricoh developed the Mirai while Olympus had their IS 1000/2000/3000 system as bridge autofocus SLR systems and the AZ 300 superzoom. The latter was a zooming viewfinder camers. The AZ 300 superzoom is (nearly) identical to the Mirai 105. Ricoh and Olympus may have exchanged models, each selling the other’s camera under their own brand name , at least that is what I heard in those days. I don’t remember that the AZ-4 lacked the bump on the top. I wonder if this is real or an artist’s impression. In the early 90-s there were more bridge cameras, I vaguely remember models from Canon, Chinon and others as well. 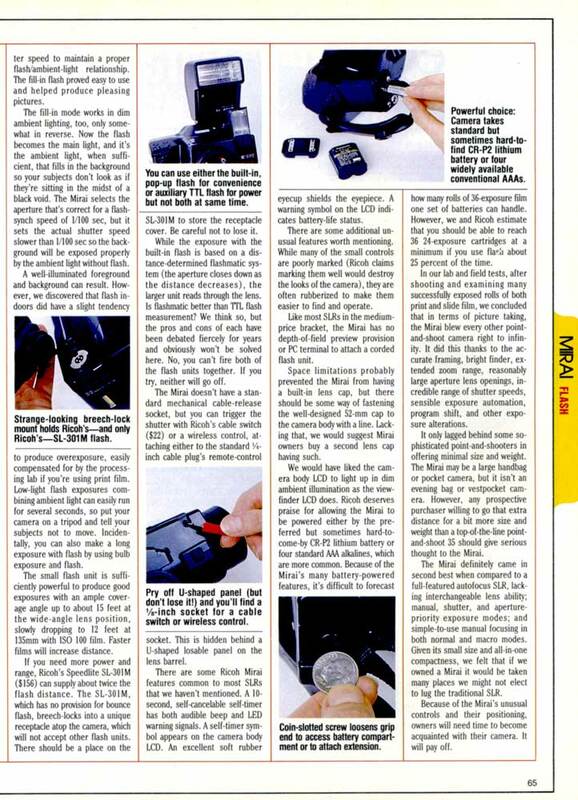 In magazine articles the iewfinder cameras and the SLR’s were compared with each other since they all served the same market. 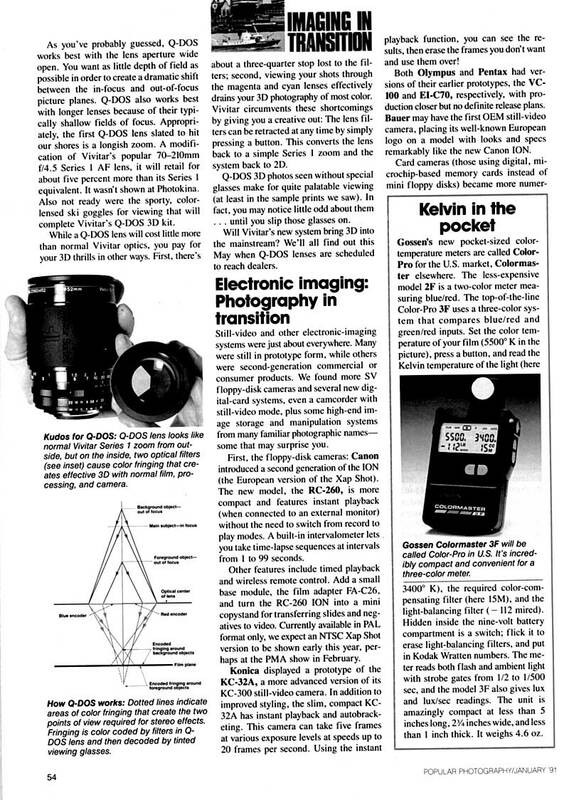 This market soon disappeared when (super)zoom viewfinder cameras became much smaller than the original bridge cameras. I just put 4 AAA’s into the Mirai, it still seems to work as it should. I’ll see if I can find an opportunity to shoot some film with it in the next couple of days. Probably during a photoshoot with my photoclub next weekend. I should have mentioned that the Mirai also works with a 2CR5 lithium battery as well. 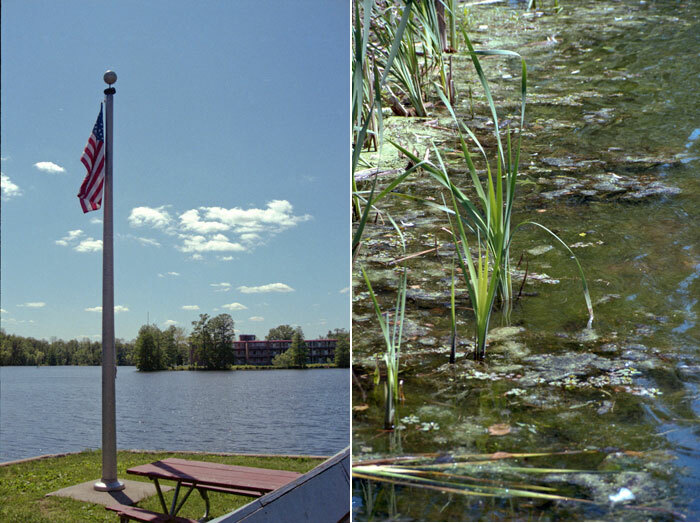 I have not seen the Olympus AZ-4 in person, but I think that the picture above is at least based on a photograph. Such sources as I could find, all (I suspect this is echoing, rather than actual confirmation) indicate a joint development of the original models. Clearly the Olympus is simpler, but substantially the same camera. I don't know about the later viewfinder models and how they are related, or not. 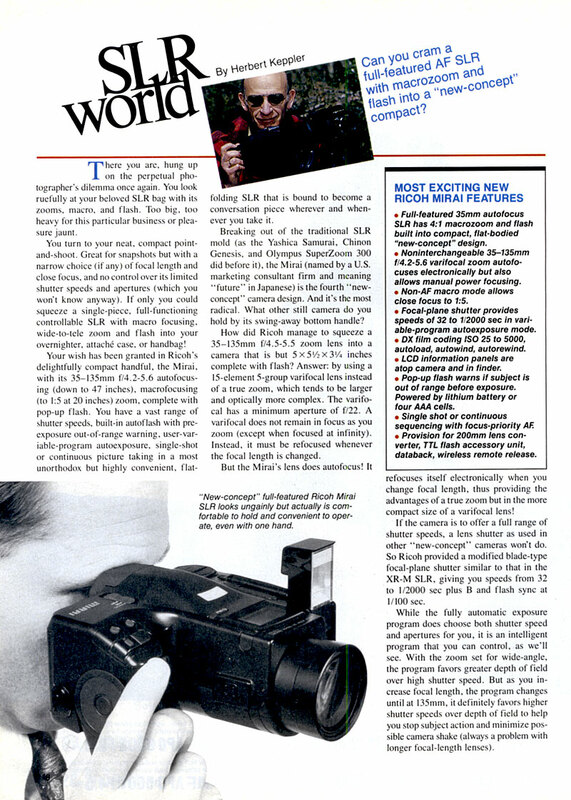 By the way, on the non-SLR "SLR" Zoom 3 version I got first, the viewfinder was truly awful, I thought. Another reason not to just shrug off the difference. The viewfinder on the Mirai 35-135 Zoom is excellent (although it is dim when the camera is turned off for reasons I don't understand but has something to do with the lens 'seating itself' when it's turned off). Not the 2CR5 but a similar one. Can't find the right number but the CR5 has contacts on the longer side on the top while the Mirai battery has contacts on the top, in the centre. These cameras predate the (widespread use of) the internet, so it's rather hard to find reliable information. I must still have the original Dutch manual, so please don't hesitate if you have further questions although I will need some time to find the manual. You're right - it's not a 2CR5 at all, but when seen alone when I took it out of the camera, it looked just the same to me. Sorry about that, I guess it's as well I didn't say anything about it earlier. It's shorter and has different contacts. Mine says CRP2 and DL223A and is from Radio Shack, and seems new and fully charged. The manual says CR-P2 or 4 AAA batteries. I checked on eBay and they range from Sanyo, etc. (post paid) for US$3-4 and Duracells for 8X that. It's certainly an odd looking beast. Thanks for the camera write up and eBay story. I've never owned a bridge camera so this is informative to me. Have fun with it! A very nice writeup, JDM. I remember when these "bridge" cameras hit the market. I thought they were a good idea, but within a very few years they were drowned by the tidal wave of autofocus-SLRs-with-the-zoom-lens kits. I suspect at least part of that was because the Mirai, et al simply didn't look like a camera should, to many people. A nice, informative post, JDM. From your results the Mirai is a very capable shooter. I think pricing probably hurt it as well as its Olympus cousin. The AF SLR kits which came with budget zooms were competive in price. The "bridge" cameras, though held an edge in zoom range. Whereas most SLR kit lenses were either 35-70, 35-80, or 28-80, most bridge cameras had wider zoom ranges. Some of them probably performed as well or better. Now that's a comprehensive post! You put me to shame, JDM. I don't have a Mirai, and I've wondered how they perform. I have a couple of the later Olympus IS series, also "bridge" SLR's, and the specs and results look pretty similar. The Mirai obviously does well what it was designed to do, so what more can one expect? 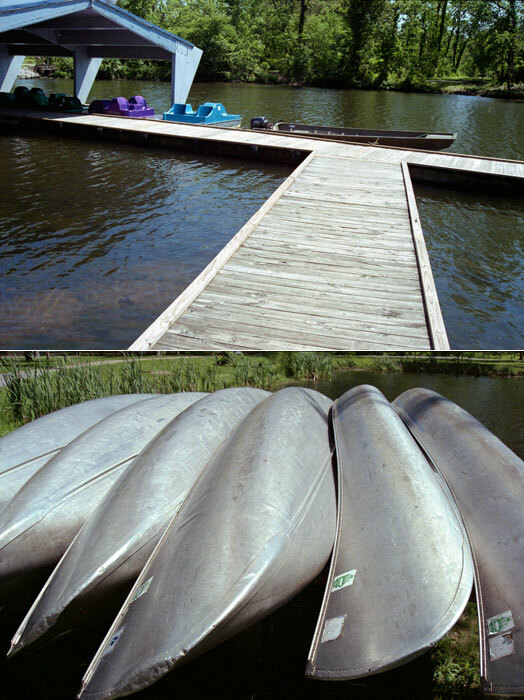 Interesting cameras from an interesting era; your demo pics are good, especially the canoes. Thank you for a very readable and informative post. Interesting post. The Mirai looks like it belongs in a future where we all supposed to have flying cars. A wonderful and very thorough post for this camera. I remember when this type of camera came out. I thought they were very weird looking but I am probably thinking about the Canon Photura. I don't think I was ever serious about buying one as I didn't go AF until 1996. I haven't been able to find a test of one but perhaps a 4 page article by Herbert Keppler might be interesting. Thanks, Marc, that's an issue I don't have. Rick D., given the high level of your own posts, I consider your compliments to be extravagant, but very welcome. 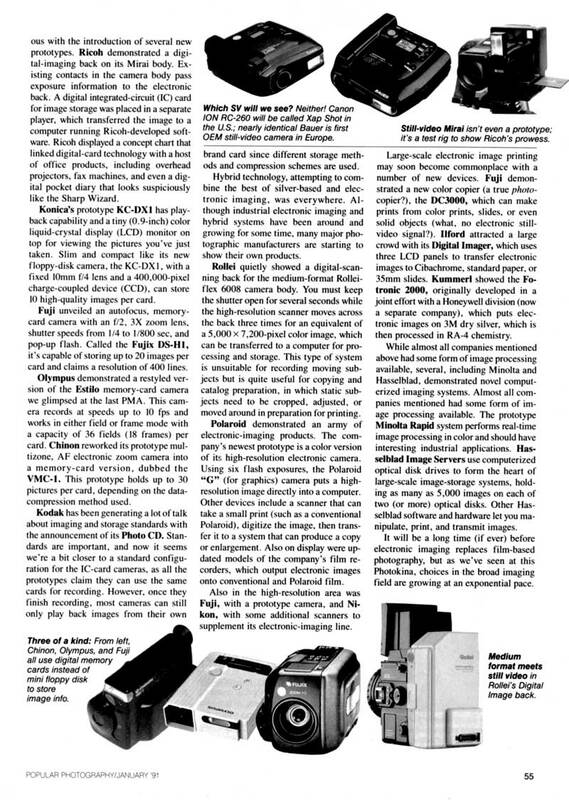 Found a version of the Mirai 35-135 Zoom with a digital back from 1991 ( http://www.digicamhistory.com/1991.html , scroll down) apparently from Popular Photography, January 1991, p55. 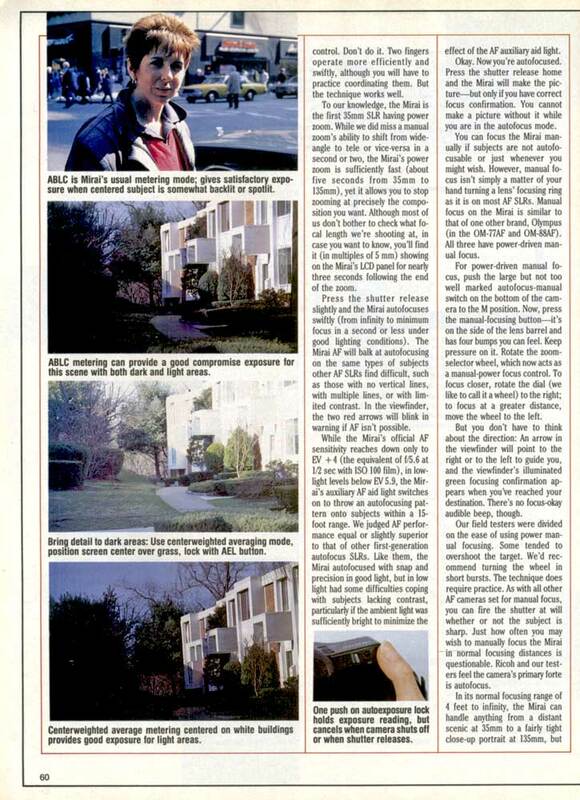 I found that Jan. 1991 article. I scanned both pages 54 and 55. It gives some interesting information about digital imaging during this time period. JDM, thanks for sharing. I think these posts are great, and sort of wish they were also in a dedicated site/blog for better browsing similar-style posts, but you're right that p-net usually ranks pretty high in search engines for those who might want to find them. Its form looks rather grotesque to the eye in 2011 but it is an interesting idea. Was that a completely unique hotshoe connector, was there an adapter for ISO hotshoe? Odd that the LCD display appears to show focus distance as a horizontal bar between the 'film spool' symbols. How does the 'manual focus work' with what sounds like it's described as a single button? Do you hold this button and use the zoom control, or is it more like 'activate autofocus now'? How well does that work? The exposure compensation buttons hidden behind a door? And can film speed be overridden or is it DX-only...or is it expected that exposure compensation would be used instead of manual ISO? (Which appears possible since exposure comp is set in 1/3 EV steps with a +/- 4 range). Marc -- that was very interesting. 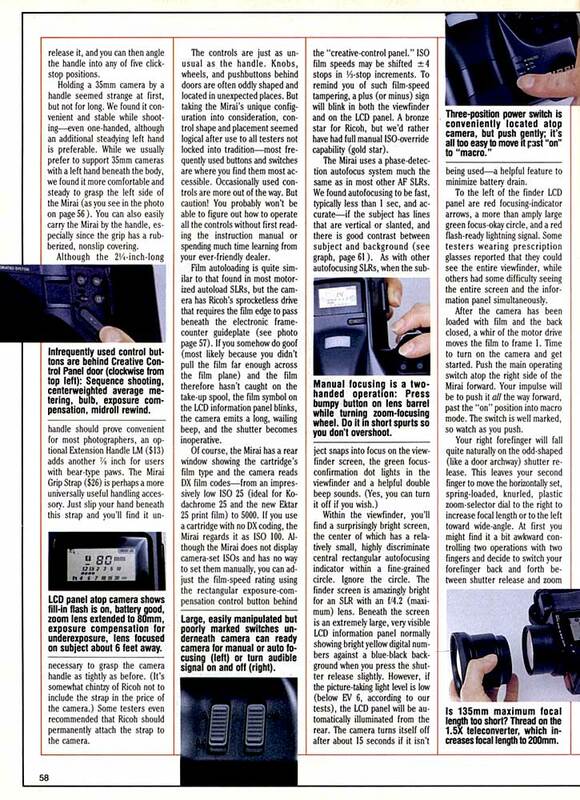 They were calling them "still-video" cameras then, and Ricoh had a video back for the Mirai! (For demonstration only though). Thanks, Marc. My own PP issues as of now only come up to 1989, and I haven't tried to get complete runs anyhow. Andrew: As far as I know the 'bayonet' flash hot shoe is unique, but there may have been other Ricoh models that took it. None of my literature on it mentions any kind of adapter to a conventional hotshoe. Manual focus in "macro" mode is just with the zoom wheel, but for other manual focus, you set it on manual on the bottom switch, then hold in the large 'manual' switch on the side of the lens, and turn the zoom knob. It's designed well so that it all works with no problem. The ISO can be set for non-DX films, but the otherwise default ISO for non-DX is 100. I don't have the manual here with me now, but I think that you can either set ISO higher manually or use exposure compensation. There is a manual on line at Butkus, but it is an html version that isn't complete, I think. I just checked Mike Butkus site and he has the pdf version. He has also done some work on his site design since I was last there. What sacrifices I make in the cause of camera collecting. 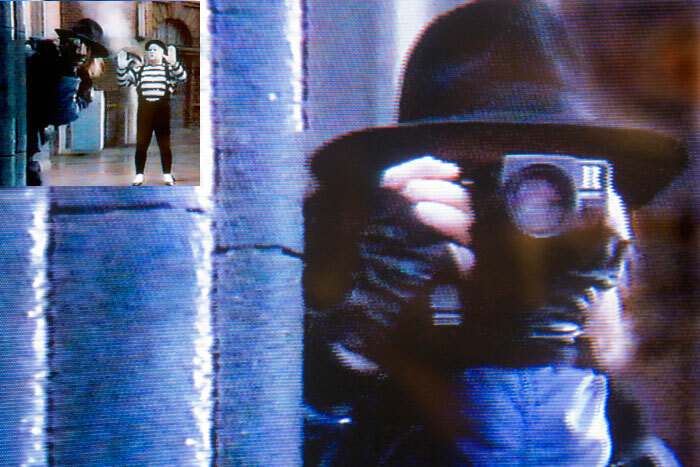 I actually watched my old VHS tape of the 1989 Batman, and found the Olympus AZ4 (or maybe even a Mirai, it's not possible to tell in low-res). It did look to me like it had the more pronounced "hump" of the Mirai, now that I think on it. It's Bob, the Joker's assistant and "No. 1 man". He is taking pictures when the Joker and the rest of the gang are getting set to wipe out the older, pre-Joker gangsters. I think Vicki Vail's camera is some sort of Nikon. In my mind why Olympus and RIoch prouduce Mirai /AZ4.Olympus was fail in AF in OM system, RIOCH is using K-MOUNT,however, Pentax is the latest step in AFSLR. How about Olympus and RIOCH facing AF Wave .which force there create a new camera .lens and body AIO also effect now.like prosumer DC with high power ZOOM lens. from AZ4 Olympus has produce ISO SYSTEM.RIOCH 's on . I found a comprehensive test of the Ricoh Mirai. 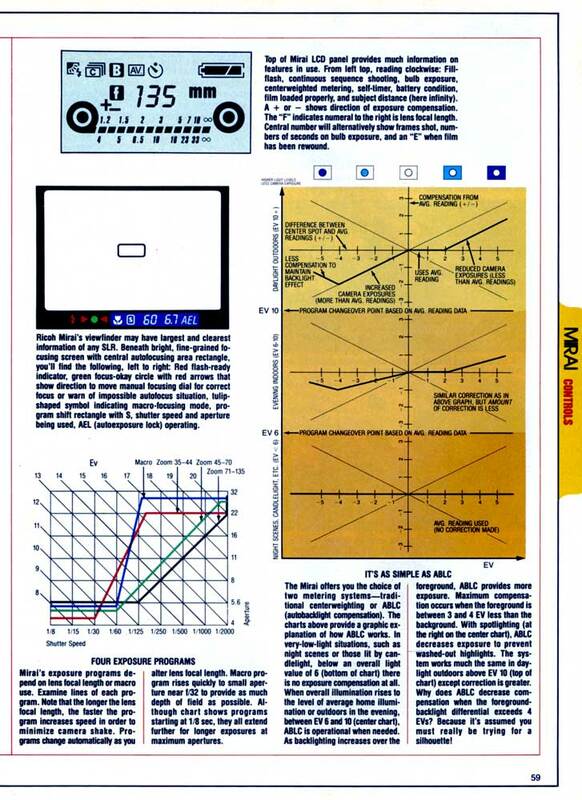 It is from the July 1989 issue of Popular Photography. It just shows how good Pop Photo was in its prime. Here is page 2 of the test. Here is page 3 of the test. Here is page 4 of the test. Here is page 5 of the test. Here is page 6 of the test. Here is page 7 of the test. Here is page 8 of the test. Here is page 9 of the test. 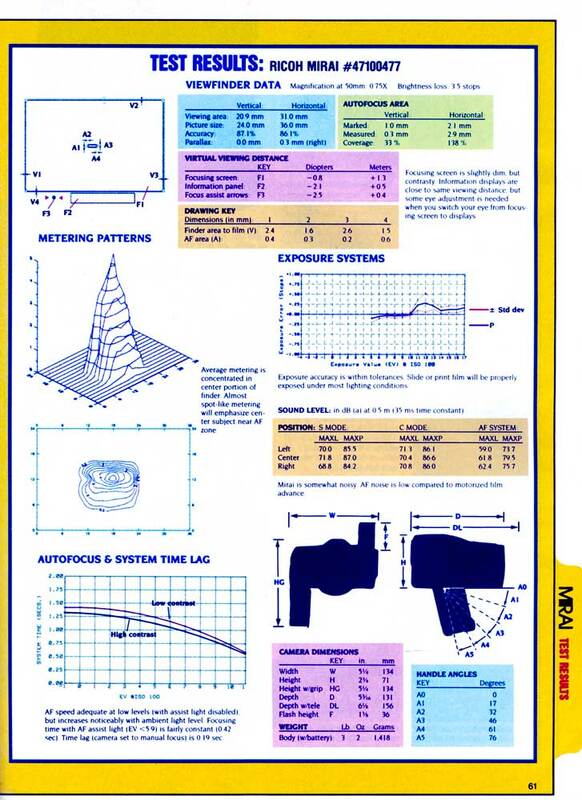 Here is the 10th and last page of the test. Sadly, I think the curious Ricoh is better-looking than that ghastly Toyota. Very informative article. I have 2 Ricoh Mirai 35-135 cameras, one of which has the date back as well as the dedicated flash and teleconverter. I managed a camera store when they first came out, but I thought they were a bit pricy at the time and didn't actually buy either of mine till the past year. I did however use one back in '89 as a prop in a model shoot. Fun camera. Love these posts JDM. The Mirai is my favorite but I prefer the lens on the Olympus IS-3. And the Samurai is a great half-frame with a lens that is far better than it needed to be. All fun cameras that can produce great pictures and can be picked up for a song. Thanks for the links, JDM. I've always liked the Olympus IS series of bridge cameras. I own (and still use) an IS 30. While it doesn't have as many features as the IS1/2/3, it's lens does start at 28mm rather than 35. Like its more featured siblings you can get a front mounted tele attachment. However, the IS1 and company not only make tele attachments (with longest providing 300mm on the IS3) they also offered a wide angle attachment to produce 28mm. 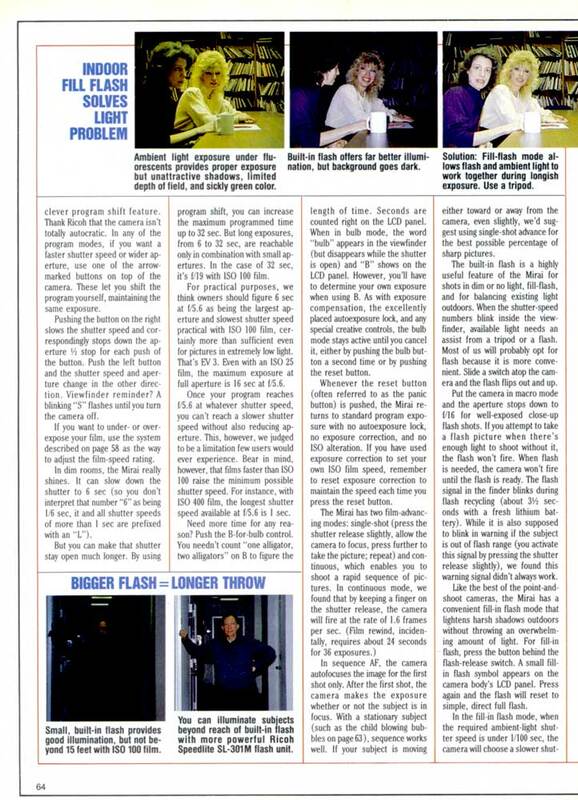 I remember that one of the photo magazines tested the IS3 with its accessory lenses and found them to be fairly decent performers. 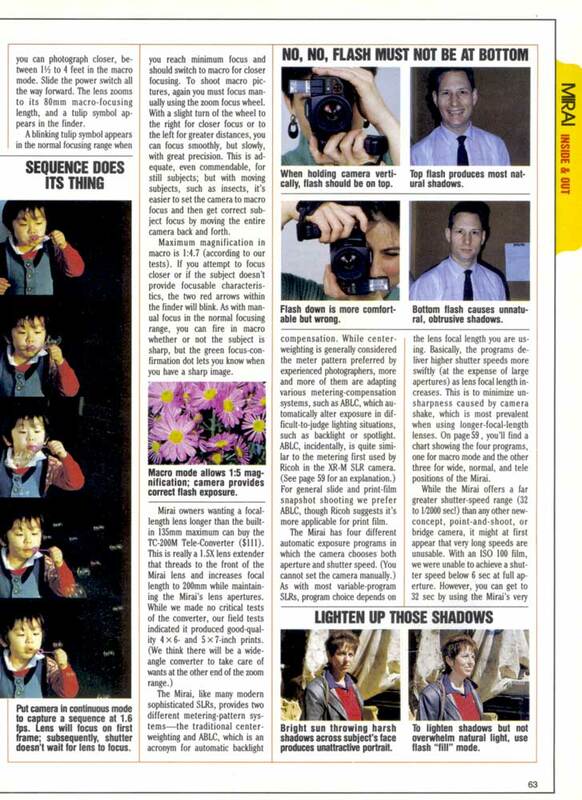 The magazine is Popular Photography, July 1993. Available online in Google books. A very thorough test of the IS-3 with an interesting sidebar on testing the lens on their bench testing equipment. Olympus provided a body-less lens and special electronics to handle it. It seems that Olympus felt they had to make the lens better than a comparable SLR lens in order to compete with the SLRs. And yes, the accessory lenses were very good, though I haven't experimented with them much to confirm that. I'm not sure how long the old electronics will last in these cameras, but they are fun to shoot while they last. Cheap enough to have a few spares around. 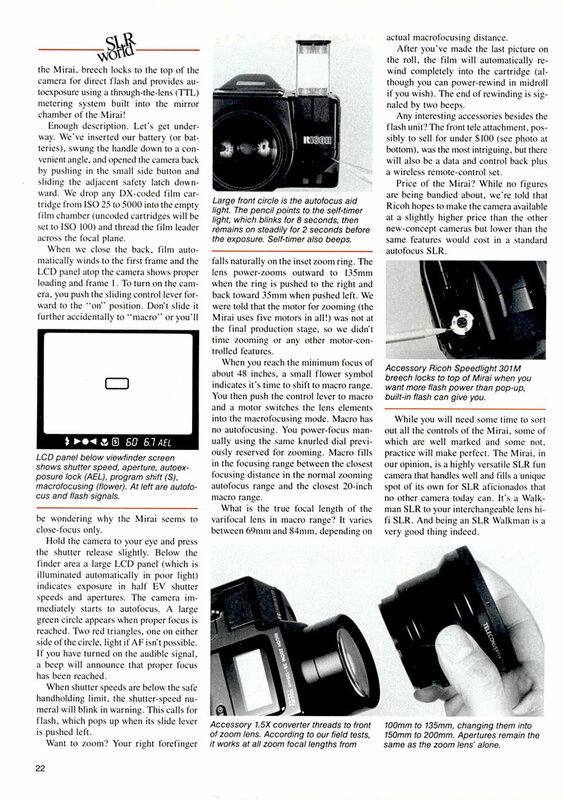 There is another article about the IS-3 in Popular Photography, March 1993 - Herbert Keppler's SLR column. Also in Google Books. wow. looks like I bougth a lemon, on ebay. The zoom dial is hardly movable, I hear a little buzz from what I guess is the zoom motor yet the lens remains in 35mm. I used 4 AAA batteries, battery sign indicates 'fully charged'. hugely disappointed. Shame. I have had one Mirai freeze up on me, but the more common issue for me was the mirror sticking. The zoom is normally really slow, but it still should move off of 35mm. Ben, if you can't get it working, contact me and I can send you a working one.